Demulsifiers are chemicals used in process of decomposition of an emulsion into its constituent liquids such as water and oil. Emulsion of oil & water at oilfields is a major reason which creates demand for demulsifiers such as ethanol and benzene. Global demulsifiers market is projected to register a 4.1% CAGR over the forecast period i.e. 2017-2024. The market is expected to ride on the back of increasing crude oil production across the globe. Additionally, increasing demand for energy is a key factor which is augmenting oil production globally. Regionally, global demulsifiers market is segmented into North America, Latin America, Europe, Asia Pacific and Middle East & Africa regions. 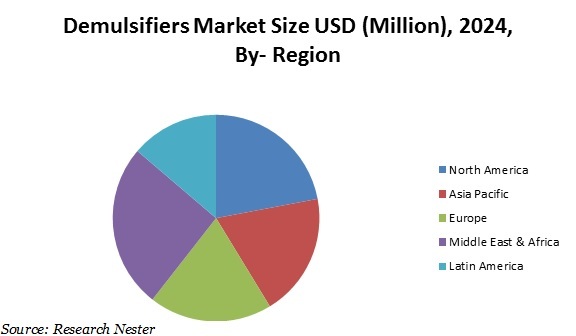 Further, North America and Middle East & Africa regions grabbed major market share of overall demulsifiers market in 2015 and anticipated to maintain this dominance over the forecast period. Further, increasing crude oil production and oil & gas exploration activities in these regions is predicted to drive the growth of these regions over the forecast period. Presence of some of the leading oil producer countries such as Kuwait, UAE, Saudi Arabia and Iran in Middle East & Africa region is a major factor which is increasing the demand for demulsifier in this region. Apart from this, U.S. & Canada are expected to contribute significantly in the growth of North America demulsifiers market during the forecast period. Moreover, Asia Pacific demulsifiers market is likely to emerge as fastest growing market over the forecast period. This growth of demulsifiers market in Asia Pacific region can be attributed to increasing offshore oil production in Asia Countries. For instance, China initiated world’s largest oil exploration sea platform. Further, growing oil demand in Asian countries such as China and India is likely to drive the growth of Asia Pacific demulsifiers market in upcoming years. Apart from regions, global demulsifiers market is segmented by type into water soluble demulsifier and oil soluble demulsifier. Among these segments, oil soluble demulsifier segment is envisioned to witness faster CAGR owing to its advantages such as it uses lower dosages as compared to other products and improves burning characteristics of fuel. The global demulsifiers market is growing on the back of increasing crude oil production across the globe. Further, high dependency of world on oil energy is a key factor which is augmenting the growth of demulsifier market. Demulsifiers are used in production of lubricants for demulsification of the aqueous phase from the oil based lubricant in order to prevent the harmful effect of water such as corrosion and foaming. Further, increasing demand for lubricants, especially in emerging countries such as India, Chain and Brazil is believed to fuel the growth of global market in upcoming years. Increasing number of offshore oil rigs owing to increasing need to increase the oil production is intensifying the demand for demulsifier. For instance, China launched oil exploration sea platform in South China Sea. Rising demand for lubricants in automotive industry is a key factor which may intensify the growth of demulsifier market in upcoming years. However, storage complications and moderate growth of oil & gas industrials are envisioned to limit the growth of market in near future.